Ferry from South Wales to Rosslare and on to Wexford for an overnight stay at the Maldron Hotel. Dinner, bed & breakfast. Discover Co. Tipperary today, with its historic walled towns, fabulous fortresses and riverside scenery. 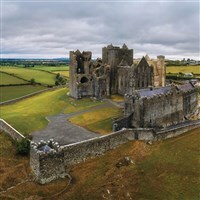 Find Cahir, a small heritage town with its own castle built on an island in the River Suir, or explore the dramatic Rock of Cashel that overlooks the Plains of Tipperary. Continue to the Lakeside Hotel in Killaloe, your base for the next 3 nights with dinner, bed & breakfast. Lillaloe, in Co. Clare has an ancient town centre and St Flannan’s Cathedral. Once Ireland’s capital, it is linked to Ballina, in Co. Tipperary, by a historic, 13 arched bridge. Visit Co. Limerick today for a visit to the Foynes Flying Boat Museum, a unique chapter in the country’s aviation history. Enjoy the attached Maritime Museum and if it’s to your taste why not sample a traditional Irish Coffee, which was actually invented here at Foynes. This afternoon board the ‘Spirit of Killaloe’ at the hotel’s private jetty (quite a lot of steps) for a scenic cruise on lovely Lough Derg, part of the River Shannon’s extensive water course. A day in Co. Clare starting at Bunratty with its beautifully preserved medieval castle & adjoining Folk Park, Blarney Woollen Mills and Ireland's oldest pub. Admission included. Continue to the coast to discover the mighty Cliffs of Moher, standing 700 feet above the Atlantic Ocean and if time allows there’s the Burren National Park as well. Time for a look at Limerick City this morning, birthplace of Sir Terry Wogan and Richard Harris and that famous 5 line poem! Then across the country for dinner, bed & breakfast at Dooley’s Hotel, Waterford. Early breakfast before the ferry crossing from Rosslare to Pembroke. Home mid/late evening. Explore timeless Tipperary & the Shannon Region on a guided river cruise plus day tours to Limerick and Clare, with traditional Irish storytelling, live music & local entertainment included. The first visit by Cooks Coaches to many intriguing parts of Ireland missing from previous tours. A family run, independent hotel in Killaloe, with awardwinning landscaped gardens on the edge of Lough Derg. All the usual facilities in the 43 bedrooms, many of which have views over the lough. No lift, but a lot of ground floor rooms. Swimming pool and spa. Free WiFi.